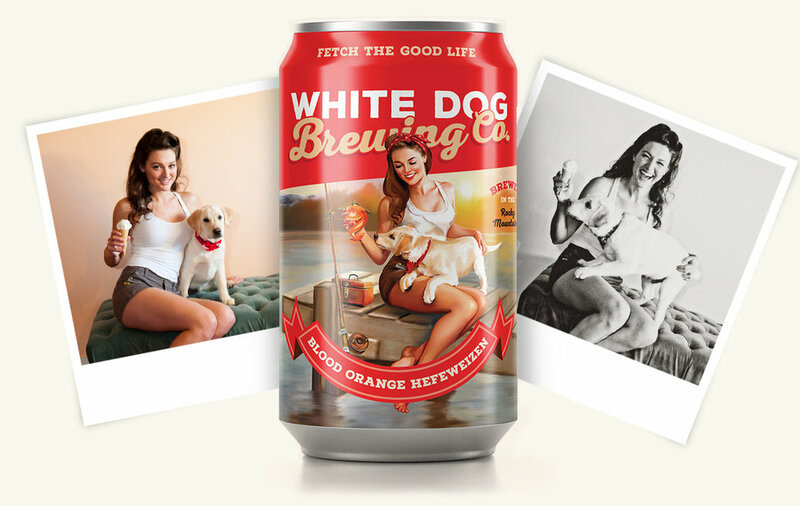 Shawny and Skagit are the models adorning our Blood Orange Hefeweizen beer. Aside from having alliterative names, their vibrant and vivacious personalities were perfectly suited for our Blood Orange Hef. It was immediately apparent during their photoshoot that the duo had great chemistry, and both were impossibly photogenic. Shawny, the consummate dog whisperer, used her talents to guide Skagit into picture-perfect poses, and then effortlessly displayed her own innate elegance for the photographer to capture. This kind of pairing is reflected in our Blood Orange Hef- a light citrus taste with a slightly fruity finish. First beer? "A warm Miller Light out of my dad's garage." Do you have a best/favorite memory drinking at White Dog? You've modeled for a lot of The Whiskey Ginger art, what is the best/funniest compliment you've ever received on it? Skagit’s favorite snacks are bananas, apple slices, and the occasional pig’s ear/bully stick from Murdoch’s. He’s also notorious for knocking over beer cans in the boat and drinking any beer that happens to spill out! Absolutely crazy for tennis balls (of course), and has a particular affection for rubber retrieving dummies shaped like game birds – his favorite has to be the mallard duck. How did your dog get its name? Skagit is named after the mighty Skagit river in Southern British Columbia/Northern Washington. The Skagit is a world-famous Salmon and Steelhead river that is equally beautiful and intimidating. Nothing too hidden, but Skagit is great at finding birds in the field, helping to land fish from the boat, and loves to ski in the backcountry with me. He gets pretty upset while skiing if you aren’t going fast enough, and tends to be very vocal about it. Skagit is a bit classier than Tinder and tends to meet ladies in more refined settings, like dog parks and pet stores.